The poem in the title is by Abe no Nakamaro, the son of a high official at the imperial court in Nara in the eighth century. A prodigy in mathematics, Nakamaro was sent to China to study the Chinese methods of measuring time. Through a series of unfortunate events, he could never return to Japan. Nakamaro is shown here sitting on the veranda of a Chinese palace, gazing at the full moon and wondering whether the moon he sees in China would be the same as the one he used to see in Nara, his home town. 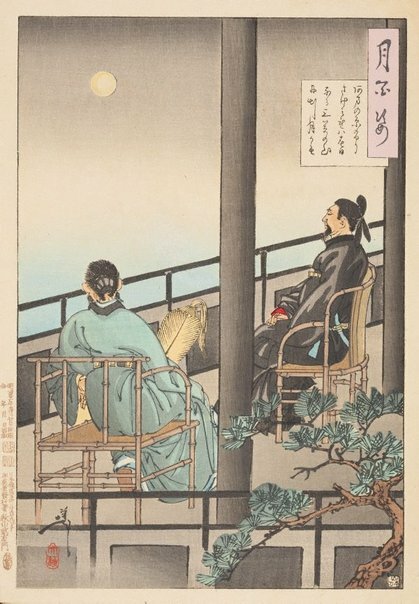 As I look into the vast expanse/ can this be the same moon/ that I saw rise in Kasuga behind Mount Mikasa?